The Rector was paid a higher income than a Curate. A Perpetual Curate was also known as a Parson till 1868 thereafter titled Vicar. Many parishes collected about 10% of the harvest and produce as aTithe(similar to a tax) and these were collected in a Tithe Barn. The tithe was collected from Wheat, Hay and Wood was called a Greater Tithe. and 10% of all other produce was referred to as a Lesser Tithe. Hastingleigh's tithe barn is next to the Old Rectory up on South Hill. It privately owned. Hastingleigh also has a Glebe of 21 acres of land, which was farmed by tenants, with profits to the incumbant clergyman. The living included accommodation at the Rectory, which was supplied to the Rector as part of the job, by the tenants at South Hill farm. the Old Rectory was sold to raise funds to cover the cost of the new building. Rector of Hastingleigh, is one of a number of named clergymen who failed to turn up for an inquest called by Canterbury Cathedral, resulting in an enquiry. The title 'Sir' is the equivalent of Reverend, and not a Chivalric title. John Peckham was Archbishop of Canterbury at this time. Robert Winchelsey was Archbishop of Canterbury at this time. Simon Islip was Archbishop of Canterbury. Archbishop of Canterbury was Simon Sudbury, who on 14 Jun 1381 was freed from the Tower of London by the Peasants Revolt, from where he was dragged to Tower Hill and beheaded. His Will passed probate in 1528 and is in Canterbury Archives. He was survived by his wife Lady Jane Crosseley. On 4 May 1541 he was appointed Rector to Hastingleigh under jurisdiction of Archdeacon of Canterbury. He was also Archdeacon of Canterbury. he adds that in some years the benefice is little over £9 for the year. The fine for not having a bible was 40 shillings per month that any parish was without a bible. Lay Patrons: Richard Botyll, Henry Stokbruy and John Knottyng. On 19 Sep 1541 he was appointed Rector of Hastingleigh under the jurisdiction of Thomas Cranmer 1533-1553, Archbishop of Canterbury. His Lay patron was Armiger Robert White son and heir of William White Esq. Note: An Armiger is someone entitled to bear heraldic arms as opposed to an Esquire, who carried someone else's arms. On 10 Mar 1543 he was ordained at Chester Cathedral, Cheshire. 15 Sep 1550 he was appointed as Licensed Curate to Hastingleigh, under jurisdiction of Archdeacon of Canterbury. There was no Archbishop of Canterbury at this time. On 18 June 1557 he was appointed as Rector of Hastingleigh, under jurisdiction of Reginald Pole. Archbishop of Canterbury. 5 May 1561 appointed Rector of Bircholt & Brabourne which were united during the life of Carrier. Under the jurisdiction of Matthew Parker Archbishop of Canterbury. Instituted by proxy in the person of Thos Honnywood Esq. The lay patron was Armiger Thomas Scotte. 'It is presented that their parson is not resident nor keepeth no hospitality.Also that he is parson of Brabourne and Bircholt. That they have had no sermon for ten years. Also that their parson doth not exhort his parishoners to beware of the threatenings of God.And also that Samson Hepps (later surname Epps) and his wife do not agree. " On 18 July 1570 he was appointed Perpetual Vicar of Waltham under the patronage of Archbishop of Canterbury Matthew Parker and he resigned from Hastingleigh. On 23 Nov 1570 he was appointed Perpetual Vicar of Petham. The lay Patron was Thomas Spillman gentleman. 17 Oct 1577 promoted to Vicar of Petham and Waltham, under jurisdiction of Archdeacon of Canterbury. 27 Feb 1583 he resigned as Perpetual Vicar of Waltham, he remained at Petham . 29 Sep 1584 re-appointed to Vicar of Petham under jurisdiction of Archdeacon of Canterbury. On 31 May 1567 He was appointed Perpetual Vicar of Waltham, under the patronage of Archbishop of Canterbury Matthew Parker. 5 Oct 1584 re-appointed to Rector of Falconhurst under jurisdiction of Archdeacon of Canterbury. 5 Oct 1584 appointed as Rector of Bonnington under jurisdiction of Archdeacon of Canterbury. On 22 Jan 1587 his natural death, as Rector of Hastingleigh(CCEd ID45263)is reported to Canterbury Cathedral. Note that this latter William Wood d.1590 has been given a different identity number from the William Wood at Hastingleigh on the CCEd data base. 14 Oct 1581 he was appointed Curate at Ickham under the jurisdiction of Edmund Grindal, Archbishop of Canterbury. He was also licensed to teach as Schoolmaster at Ickham on the same date. The Rector of Ickham at this time was Samuel Harlestone who ministered the parish for 48 years from 1558 till his death in 1616. 10 Apr 1592 he was re-appointed Curate of St Mary Northgate, Canterbury. The only record of his term at Hastingleigh is gleaned from the Bishop's Transcripts as he compiled the annual return of Baptisms, Marriages and Burials for the parish between 1579 and 1581. As the Reverend William Wood was the Rector at this time, William O'Kell would have been Curate at Hastingleigh. I have as yet not found any further information on what became of him.
. no information at this time. 14 Sep 1607 re-appointed Vicar of River & Lydden under jurisdiction of Richard Bancroft Archbishop of Canterbury. 16 Apr 1634 appointed Vicar to Lydden & River under jurisdiction of Willam Laud, Archbishop of Canterbury. Oct 1596 appointed Curate of Hastingleigh under jurisdiction of Archdeacon of Canterbury. 30 Mar 1599 appointed Curate of Herne, under jurisdiction of John Whitgift Archbishop of Canterbury, John Hunt was a licensed Teacher. For several years, he signed the Hastingleigh Archdeacon returns. I cannot find any record of his location for the years between leaving Hastingleigh in 1602 and his next known posting. 3 Sep 1623 promoted to Curate of Bilsington under the jurisdiction of George Abbot, Archbishop of Canterbury. 1566 - he went to Peterhouse College Cambridge (therefore was probably born in late 1540s); he then migrated to Trinity College Cambridge. 31 Mar 1581 appointed Perpetual Vicar of Shudy Camps, Cambridgeshire under jurisdiction of Richard Cox, Bishop of Ely, his Patron was Trinity College Cambridge. He resigned the same year. 1 Sep 1589 removed from being Rector of Eastbridge and appointed Rector of Ivychurch to 1614. 26 Mar 1595 appointed Rector of Lyminge till 1611 under jurisdiction of John Whitgift. his Lay patron was Armiger William Lovelace. 5 Oct 1596 he was re-appointed Rector of Hastingleigh under jurisdiction of Archdeacon of Canterbury. (CCEd) He is buried in Rochester Cathedral. His will passed probate on 4 August 1614. 5 Oct 1598 appointed Perpetual Vicar of St Mary Bredin, Canterbury under jurisdiction of John Whitgift, Archbishop of Canterbury, his Lay Patron was Armiger Richard Hardres of Hardres Magna (Upper Hardres). 27 Nov 1601 appointed Rector of Hastingleigh under John Whitgift's jurisdiction and Whitgift was his Episcopal Patron. 11 Jan 1602 resigned as Perpetual Vicar of St Mary's Breden. 19 May 1630 Deacon John Tailer of Elmsted & Hastingleigh testimonial written citing his new status as Deacon. 1633 Edward Barbet obtained this benefice June 28 1633, but his Vicariate was a troublous one, and he himself may be deemed a Martyr. Upwards of thirty of the Parishioners petitioned the House of Commons against this Vicar in February 1640-1. They complained that 'having by riotous living consumed the greatest part of his estate, laye in prison by the space of halfe a yeere and more; and, having made composicion with his creditors, betooke himself to the ministry, and was presented by the Archbishop to the Vicaridge of Chislet. And, touching Divine Service, hee reads soe false, and with such ill gesture, and ridiculous behaviour, and soe careless in reading, that sometimes he reads the Ten Commandments twice over, at morning Prayer, besides many other slips, mistaking, and negligences. And touching his preaching, hee is very unable and unfit, in respect hee never studied Divinity, as may appeare by his weake and unlearned sermons. And touching his life and Conversation, it is well knowne, that he is a common lyer, a notorious swearer, a foule speaker, uttering sometimes words as are not to be spoken by any modest man, nor to be heard by any Christian ears. Edward Barbette of Chislette. He was not only sequestered, but also involved so much in other sufferings, by the Rebellion, that he was utterly ruined: For at his death he left his Wife so deeply in debt, that she was forced to sell her own lands to pay it; and was at last reduced to such a miserable, poor & deplorable condition, that she was necessitated to beg the Publick Charity of the Corporation before mentioned, and was supported by that means. NB: Edward Barbet was re-appointed as Vicar of Chislett on 4 May 1642 under the jurisdiction of the Archdeacon of Canterbury. It must be noted Mr Barbett had been at Chislet for some 7-8 years prior to the letter being submitted to the House of Commons. One must question why such a letter was addressed to Parliament, when the Archbishop of Canterbury held jurisdiction over Edward Barbett's appointment to Chislet. The Archbishop William Laud, was a staunch Royalist, and the 'Long Parliament' of 1640 had accused him of treason and imprisoned him in the Tower of London- where he remained until his trial in 1644. It is likely that Barbet, being a friend of the Archbishop and a likely Royalist himself, found himself at odds with the Parishioners and after 8 years service to the Parish, they deemed it necessary to ruin his reputation as they sided with the republicans. John Taylor would have been sent to cover duties at Chislet in very difficult times. 5 May 1642 John Taylor was appointed Curate of Bilsington under the jurisdiction of the Archdeacon of Canterbury. 25 Aug 1646 John Taylor wrote his will- leaving money to the village, and directing that he be buried in the chancel of Hastingleigh Church. His will also benefitted his children Thomas, George, John, Mary, Joane Taylor & Marie Stokes and her son John Stokes. Witnesses to the Will are Henry Stokes & Edward Browne. There is no visible tomb stone for Rev. John Taylor, that survives to be identified. It is possible no grave stone was carved, as his death coincided with the latter days of the 1st English civil war. 3 May 1597 licensed as Curate under jurisdiction of John Whitgift Archbishop of Canterbury at Canterbury. NB: There is a Henry Nye appointed Rector of Clapham from 1620-1628 which is consistent with Hastingleigh's Curate, but these may be 2 separate individuals though is an uncommon name. it is likely therefore that Henry Pibus was buried in the church, but no record can be found. As the next Rector took office in 1686 we can assume it was this year, or thereabouts. The door jamb of the church holds a carving of notches which spell HPIBus, though undated, it probably refers to this Rector. but marriage is not listed in Archdeacon records. 1694 - He resigns as Rector of Hastingleigh. Baptised 5 March 1651 Eastry Kent, the son of John Smythe of Chart and Mary Bargrave daughter of the Dean of Canterbury Cathedral. He died 7 Sept 1732 and his death is reported in both Parishes. His will passed Probate in 1732. 1716-1736 Vicar of Elmsted , several of his children were buried at Elmsted Church during his time as Curate. .no further information at this time. born 5 Jan 1754 Chislet, the son of Rev Nicholas Simons, Vicar of Chislet. He attended Charterhouse School and then Christ College Cambridge from May 1772 then Clare College from 1779. 1776 succeeded his father to the family property in Leicester. 1779-1795 Chaplain to Archbishop of Canterbury Cornwallis and Rector of Hastingleigh and Vicar of Elmsted. 3 Jan 1781 married Elizabeth Tucker at Hastingleigh. She was the second daughter of Rev. John Tucker, Undermaster of the Kings School Canterbury. He died 20 Apr 1839 and his Will passed probate Jul 1839 Clerk of Canterbury. June 1772 - following a Marriage Settlement (the document is in National Archives) he married Elizabeth Barry a wealthy spinster from Hull. 29 Nov 1773 appointed Rector of Rand, Lincolnshire, Lay Patron Harrington Hudson. In 1795 Nicholas Simons and William Welfitt swapped parishes. "The remains of Revd. William Welfitt DD 47 years Prebendary of this Cathedral who departed this life 3rd Feb 1833 aged 87 years & of Elizabeth his wife , died 28 Jan 1837 aged 92yrs 9 months." An article regarding his daughter Mary and the transfer of the Welfitt surname & coat of arms -by Royal grant of Queen Victoria (click to view). Some further insight into the state of affairs within the precincts is afforded by the unpublished Reminiscences of the Rev. George Gilbert, a prebendary of Lincoln, who in early life lived in the precincts at Can terbury. In his gossiping pages Mr. Gilbert tells us that Dr. Welfitt was chaplain to the House of Commons, and regarded this post as a claim for cathedral prefer ment. He made elaborate (and financial) arrange ments with the physician of a dying prebendary for the earliest news of his demise. By some mishap, the tidings arrived three days late after all. He therefore promptly saddled his horse and rode eighty miles without halting, saw Lord North, and secured the stall.
" Do you not think, that after such a day's labour I deserved a stall?" said he to Allen Fielding, then vicar of St. Stephen's, " "I am sure your horse did," was the witty reply. Whatever his deserts, he was prebendary for forty-seven years, resided nine months in every year, and attended service twice daily ; indeed, there was one year, shortly before his death, in which he missed only one service. With such devotion to Canterbury Cathedral duties, it is hardly surprising that there was a need for Curates to act on his behalf for most of his time as Rector of Hastingleigh. In 1817 he resigns as Rector of Snargate. He was married to Susannah by 1797. He died in 1832, his Will is at Canterbury Archives, he died at Brenchley, Kent. (during incumbency of William Welfitt) . no information available at this time. 4 Aug 1806 married Frances Swinford of Margate at a church in Margate. born 27 Feb 1787 second son of John Baker of Kent, and his wife Jane Tattersall (m.15 Oct 1776 St Pauls, Covent Garden) he attended Charterhouse School then St Johns College, Cambridge. Ordained a Deacon at Canterbury in 1811 and priest in 1812. 1811 Curate of Hastingleigh and Elmsted. He married Frances Tattersall (his cousin)the daughter of John Tattersall, Vicar of Harewood, Yorkshire. also Vicar of Westbourne, Sussex between 1828-1834. Attended Charterhouse School followed by Trinity College Cambridge. He was awarded a BA in 1801 and an MA in 1810. 13 June 1802 Ordained a Deacon at Winchester. 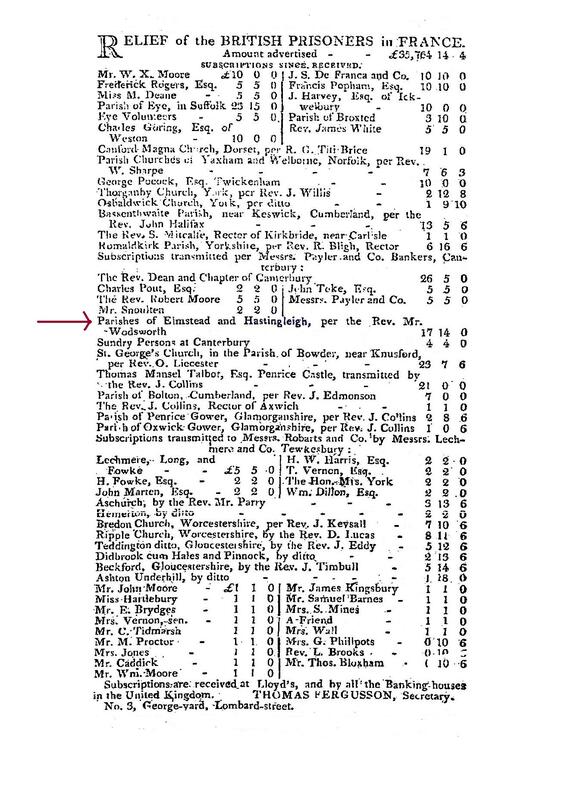 25 Nov 1809 he married Mary Ann Pittock (of Eastry) at St. James Church, Westminster. 1817 Licenced Curate of Hastingleigh with Elmsted. 16 Nov 1839 marriage of eldest daughter Mary-Ann to Mr Lees Broadbent a Surgeon of Ashton-Under-Lyne, Lancs. b. Abt 1798/99 in Hythe, the son of William Deedes and his wife Sophia Bridges daughter of Sir Brook William Bridges. 3rd Baronet. 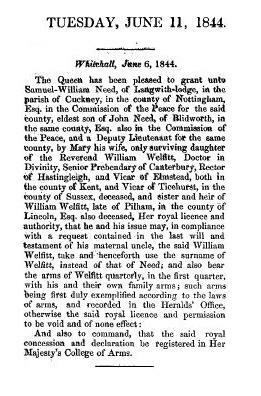 In 1828 becomes Rector of Wittrisham (Wittersham). 14 May 1829 at East Peckham he married Henriette Charlotte Dering (b.1806 Brompton, Middlesex d.1904) sister of Sir Edward Cholmeley Dering 8th Baronet. In 1832 is noted as the Preacher at the Archbishop's visitation. 4 Jan 1831 baptism of son Julius William Deedes at West Peckham His 4 daughters all baptised at Wittersham. 1847 resigns Wittersham and is appointed Vicar of Marden and Rural Dean. He died 24 Oct 1879. Archibald Hamilton Duthie, born 9 Dec 1797 St Mary's, Jamaica, West Indies. Married Mary Murray 6th Jan 1828 in Stirling, Scotland relocated to act as Curate for William Welfitt who was too elderly to commute to handle his duties at Elmsted & Hastingleigh. He was then Rector at Deal by 1851 until his death. 27 Aug 1839 Union of Hastingleigh and Elmsted Parishes, under Gostwyck Prideaux. Population of Elmsted is 502 persons and generates a living of £170 per annum, while the population of Hastingleigh at 216 generated £150 per annum, but also supplied the Rectory, whereas Elmsted was without accomodation and just the Glebe lands belonged to the church. Born 25 Jan 1797 North Tawton, Devon , eldest son of Thomas Prideaux Esq. He attended schools in Salisbury and Winchester then to Sydney College Cambridge from 1816. 1821 ordained as priest at Canterbury. 1826 - 1833 appointed Perpetual Curate of Iwade. 1833 Ceded Iwade and became Vicar of Elmsted and Rector of Hastingleigh till his death in 1880. 27 Mar 1880 Rev. William Gostwyck Prideaux was buried at Hastingleigh (PR & grave stone). He was a very principalled Rector and disapproved of the fees charged for Baptisms and Burals, consequently Hastingleigh church was used as the place of Baptism for many Travellers, Gypsies and Tinkers until his retirement. For his burial he avoided the fees for cutting the sod of earth, by being buried under the church perimeter fence in a tunnelled tomb. His Gravestone is now right next to the recently built lychgate.Details of the inscription and a photo are on the cemetery pages for this website. Patron: William Howley Archbishop of Canterbury (1828-1848) and his successors. I have noticed in the parish records that in 1871 Reverend Prideaux was absent from recording several church events and when he returns to duty his handwriting (once very neat)is now very poor, it would indicate perhaps, that he had suffered a stroke causing disablement to his writing arm. Harriet Pett Hannam of Northbourne, Kent. He had 3 sisters: Harriet Ann Collett born Aug 1929 who married John Ley, a Canadian Land Owner. Maria Collett born Jan 1834 who never married, she died 1894 and is buried in Elmsted churchyard. Frances Ellen Collett b. 1849 never married and was house keeper to her brother, till she died in 1915. Anthony Collett was educated at Trinity College, Cambridge. Ordained Deacon at Canterbury Cathedral in 1859 and Priest in 1860. From 1880 to 1895 Anthony Collett was Rector of Hastingleigh with Elmsted, and from 1895-1906 Vicar of Bredhurst. He retired to his large house in Barton Fields on what was then the outskirts of Canterbury, where he died on 10 Dec 1924, aged 89yrs. He was buried 15th Dec 1924 at Elmsted Church with two of his sisters. to the Parishes of Hastingleigh and Elmsted. At the time of writing this, his mansion house is the YHA Hostel at 54 New Dover Road. Collett Close in the hamlet of Bodsham, in Elmsted Parish is named in his honour. he was also instrumental in the creation of the school at Bodsham, and he built the Vicarage at Bodsham. Click Here to read a newspaper report about his tragic death. b. 1866 Brighton Sussex, eldest son of Captain Octavius Frederick Timins and his wife Ann. He attended school at Tonbridge and then to Clare College Cambridge from 4 Oct 1884. 1889 Ordained a Deacon at Liverpool. 1889-93 appointed Curate of Warrington. 1917 - twice mentioned in dispatches. He died 18 May 1941 at Weston-Birt, his widow Emily was killed in an air raid on Bath in April 1942. "One of that dwindling band of sporting parsons who have done much to enrich English country life. Used to drive his own coach-and-four to Canterbury cricket-week; kept a proverbially good cellar of port, and was regularly to be seen at Tattersalls, in Knightsbridge, on Mondays, buying his hunters and ponies." Born 1 Sept 1869 Hampstead, London the son of Thomas & Mary Hill, he attended Kings College London, then Trinity College Cambridge. In 1893 he was ordained a Deacon at Winchester Cathedral, then Priest in 1894.
and from 1897 to 1898 Curate of Wrotham, Kent. and Vicar of Elmsted, where he remained till 1916. Rector of Kennington near Ashford. He died in Ashford in 1950 aged 80. Born 23 May 1873 the son of George Chester Cooper of Addlestone Surrey. He attended Kings Canterbury then Trinity College Cambridge. In 1903 he was ordained at Chichester becoming a priest in 1909 at Canterbury. 1928-1932 Rector of St George with St Mary Magdalene, Canterbury. Later of Little Chart Rectory, Ashford. He died in 1955 Canterbury aged 82. Rev. William Cobbe and Jane Selina nee Beresford. He died in 1927 aged 52 in Dover Registration district. His mother died 3 years later in Dover. 1921-1930 Rev. Horace Hammond	 .. no information available at this time. later to Thannington, then in 1957 to Smarden. b.123 Jan 1898 Pocklington Yorkshire, son of Ada Ruth Finch (nee Thompson). In WW1 he was Private C1273 in the Kings Royal Rifle Corps on the Western front for 3 years. He was captured south of Ypres by the Germans and held as a POW. After the war, he trained in the ministry at Mirfield in Yorkshire and was ordained at York Minster in 1922. Curate at St. Andrews Broadstairs. Rector of Petham with Waltham. He died in late 1975. 1953-1955 Rev. John Victor Strangeways	 . no information available at this time. born 16 May 1878 Formerly Vicar of Hythe, he agreed to officiate at services in Hastingleigh until a replacement could be appointed. A brass memorial plaque to him and his wife is in Canterbury Cathedral. April 1955 Elmsted and Hastingleigh are once again joined together as a United Benefice. Rev. AE Prior transferred to become Rector of Hastingleigh, Vicar of Elmsted. He resigned due to ill health on 10 Oct 1962. He died 30 September 2004 aged 72. He died 24 Aug 2006. aged 86.
becomes 'Priest in Charge' in 1975, having already retired in 1967. He resided at St. Andrews Lodge, Bossingham till his death. He died 11th August 1975 and his body was cremated. The ashes were interred in Elmsted Churchyard on 17th Sept 1975. He died 16 February 2008 aged 71. 1984-1990 Rev. John Hewes	 . no information available at this time. Died 18 May 2007 aged 86. Buried in Hastingleigh near to the lychgate . 1990-1995 Rev. Richard Bateman	 . no information available at this time.